We’re running on your schedule. 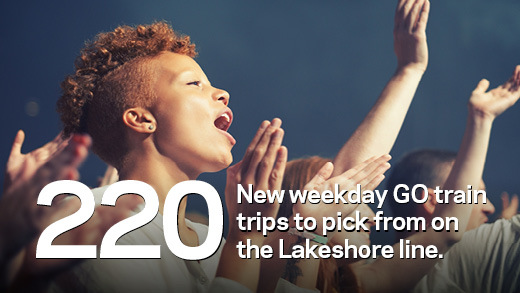 Starting September 24th, we’re introducing 220 new weekday GO Train trips along the Lakeshore East and West, running both ways. Our biggest increase of GO train service in five years! 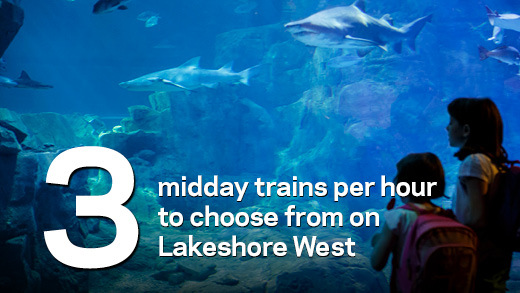 You can GO where you want, when you want with trains every 15 minutes or better on Lakeshore East, and three trains per hour on Lakeshore West between Union and Oakville. With hundreds of new trips between our busy morning and evening peak travel periods, we’re taking the thinking out of travelling. So whether you’re looking to enjoy brunch at that hot new spot, indulge in some retail therapy, or experience an underwater adventure – we’ve got you covered! The only question is where will you GO first?